A Jewish community association in northern Sweden has decided to close following a series of far-right threats, seven years since it opened. Their centre in the town of Umea was targeted with swastikas and daubed with messages like "we know where you live", and a car was vandalised. Local members said the authorities had been unable to provide enough security. Community spokeswoman Carinne Sjoberg said some people no longer dared to come to the centre. Neo-Nazi group Nordfront were behind the hate campaign, she said, initially targeting her but then other members of the community too. The last straw came at the weekend when the windows of a member's car were broken. "Our kids go to ordinary school, so members started to feel they didn't want to bring the children," she told the BBC. "My mother and father are (Holocaust) survivors, so this is not OK. Enough is enough. It was like stepping into their shoes in the 1930s." Umea also hit the headlines two years ago when a march was held to mark the anniversary of Kristallnacht, the outbreak of mass violence against Jews in Nazi Germany in 1938. The town's Jewish community was not invited. Ms Sjoberg said that despite the closure of the centre, the community would fight to have a meeting place in the future that was more central in Umea and easier to protect. 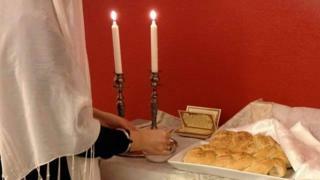 Community leaders say the situation for Jews in some Swedish towns is difficult. "We've had problems with neo-Nazis in Gothenburg and Umea, but in other cities like Stockholm we feel safer," said Isak Reichel, secretary general of Sweden's central council of Jewish communities. For Jews in the southern city of Malmo the threat was mostly from Islamist groups, he told the BBC. Kristallnacht 75 years on: How strong is anti-Semitism in Germany?